Apart from smartphones, Samsung is known for its smart refrigerators. Yes, the tech Samsung packs in its smart refrigerators might seem like overkill, its smart Family Hub refrigerators do look enticing. Samsung first introduced its Family Hub lineup of smart refrigerators back in 2016, and it claims it was an instant success. Building on the success of the original Family Hub smart refrigerator, Samsung has just introduced the newest model of its Smart Refrigerator, which the company is planning to showcase at the International Consumer Electronics Show (CES) from January 9-12, 2018. The biggest feature of this year’s Family Hub smart fridge is the integration of SmartThings ecosystem. This feature allows users to not only control the Samsung made smart home devices but also third-party devices which are supported by the service. Users can now control lights, thermostats, doorbells, monitor baby cameras, and more. The second most important update is the full integration of Bixby. Although Bixby was introduced last year for the Samsung’s Family Hub smart refrigerators, she was limited to only basic voice commands. Now, Bixby is fully integrated and has gained its full capabilities. Bixby can now recognize an individual’s voice and respond with answers tailored to them. For example, if a family member asks Bixby, “Hi Bixby, what’s new today?”, the smart assistant will theoretically show the calendar appointments of that specific person and not some other family member. Lastly, the smart refrigerator also packs an AKG branded speaker. Users can now play millions of songs using streaming services like Spotify, stream content directly from their smartphone, and even mirror their Samsung smart TVs. 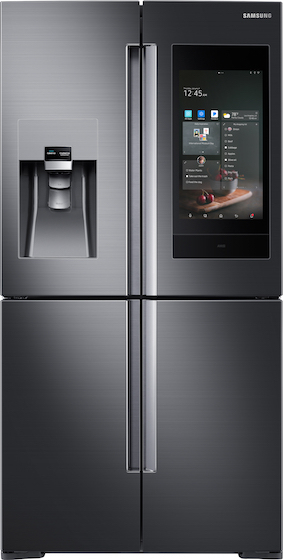 Now the smart refrigerator is not just a place to see recipes and hear instructions but a place where family members can socialize while cooking or having meals. Samsung has put a lot of thought into its Family Hub smart refrigerator to make it the one-stop solution for all your smart home needs. And yeah, it also keeps your food fresh, helps you plan your meal, allows you to check what’s inside the refrigerator from anywhere (using their mobile app), and much more. The 2018 Family Hub line of refrigerators will launch this spring, but the company is yet to disclose its prices.